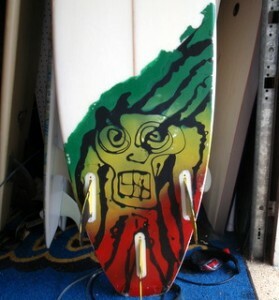 Ever since modern surfing began surfers have been painting their surfboards in a whole variety of ways. The styles of art have changed a lot over the years, and today you can see a little bit of every kind of surfboard art on the boards out in the water. About 5 years ago I traveled to the North Shore of Oahu to stay with a friend for a few months and I loved the way one of his boards was painted. I had seen that kind of surfboard art before, but never knew how it was done. He explained the process and I never got around to trying it out until I was reminded of it a few years later. This style of surfboard painting involves using dishwashing soap to create unique designs on the board that almost make the paint look like it was perfectly splattered on the board. You only need a few things to paint your board this way: spray paint, masking tape, dishwashing soap, and a hose. The first thing you do is tape off the areas you don’t want painted such as a traction pad, the rails, or logos. Then splatter on some soap in any pattern you want. Spray paint the board where you want the design to be. At this point you can do multiple colors, or add more soap after the first color. After that you spray off the soap with the hose and remove the tape and you’ll have a sweet looking board.